Sinn Féin Councillor Sharon Duddy has welcomed confirmation from the Department of Infrastructure that it is to introduce ‘Keep Clear’ markings at the junction of Laburnum Terrace and Beechwood Avenue. Colr. Duddy, who had contacted the department over the issue, said the move is to try and keep the free flow of traffic at peak times of the day. “I had been receiving complaints over many weeks about the constant gridlock of traffic at peak times of the day on Marlborough Terrace, Beechwood Avenue and Laburnum Terrace. 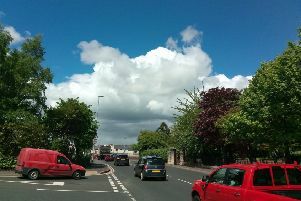 There is a particular problem for vehicles exiting and entering the junction at the bottom of Beechwood Avenue. “It is also causing problems for residents being able to park outside their homes, as well as air pollution. Anyone who would travel through the area knows the problems both motorists and residents have to encounter on a daily basis.